It’s odd, at least on the surface, that a game so unabashedly abstract as Tash-Kalar should also be so profoundly evocative. It’s a testament really to the power of game mechanics to drive narratives. Back in the day there was a game studies debate that raged for years, consuming many bright minds in the corona of its futile intensity – it was the battle between the ‘narratologists’ and the ‘ludologists’. Or, in simpler terms, those that believed games were formal systems that could not be meaningfully analysed on a narrative level and those that believed games were stories and mechanisms played a distant second fiddle to that. The weird thing about that debate is that everyone who was involved in game academia remembers it happening but it never actually did except on the periphery of the field. That was probably because both extremes are nonsense and even in academic writing there’s only so long nonsense can be entertained with everyone still retaining their dignity. The best games put the lie to the idea there is any kind of hard divide between theme and the game systems upon which that theme is layered. They use theme to inform the mechanisms and the mechanisms to tell the stories. A game in which both of these elements cohere can feel immersive even if all you’re doing is pushing tokens around a grid. And that’s exactly what it’s like with Tash-Kalar. 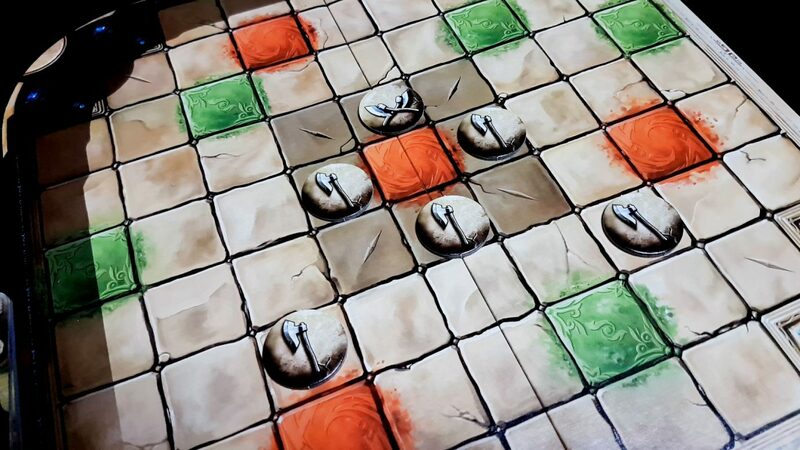 You’re faced with a sterile board that represents an arena of magical battle. 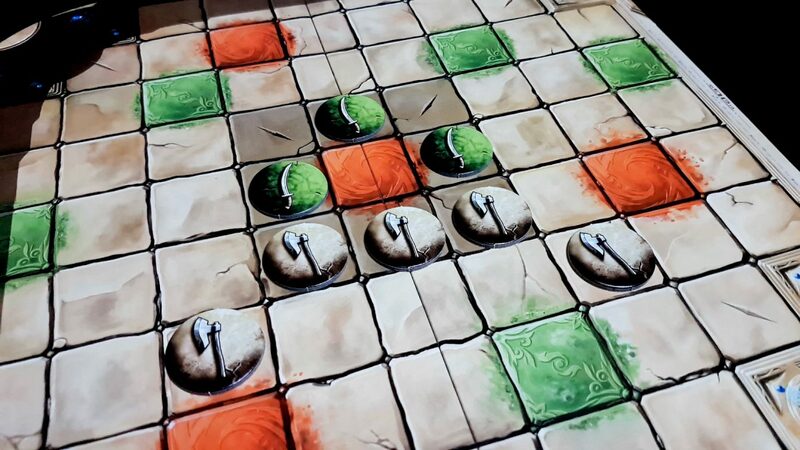 Every turn you can place a piece or summon a creature making use of patterns you’ve created on the grid. When you bring forth your new beastie there will be a game-changing effect that you trigger and then the board-state lapses once again into abstraction. There’s no difference between one unit of a particular type and another unit of that type once it’s been summoned into existence – you don’t really create soldiers, you create transient moments of impact on an intensely competitive shared game space. Each of the players are going to be controlling a faction, and each faction has a particular kind of flavour to go with their theme. 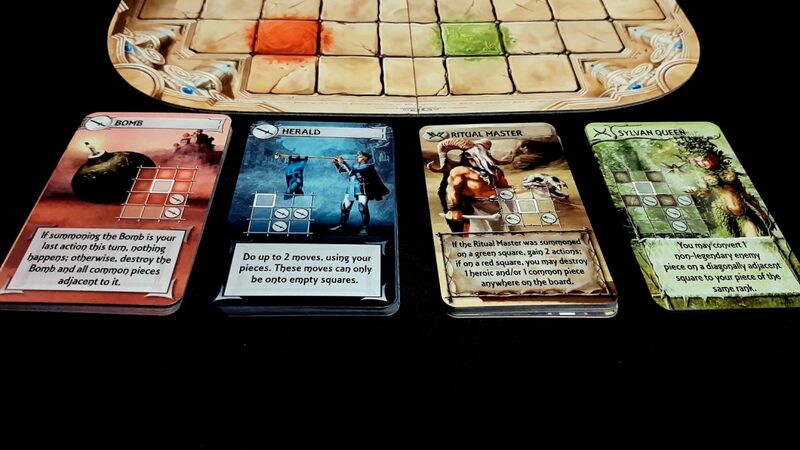 Blue and red are identical – matched decks of imperial powers that ensure you can’t blame the cards in a battle. 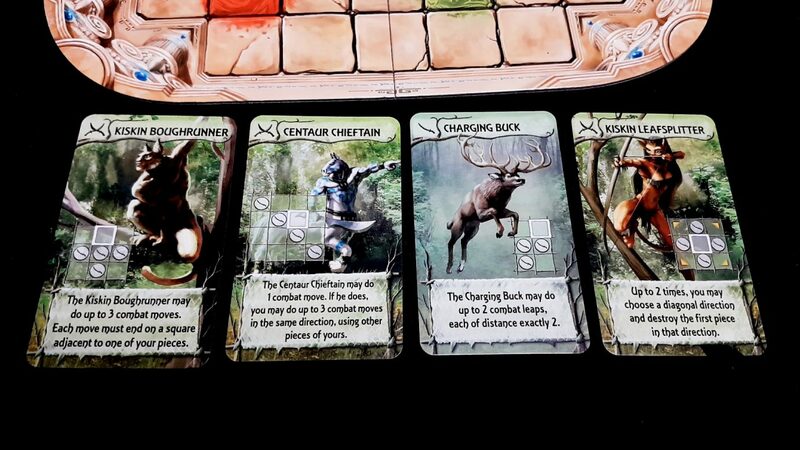 There are also the Highlanders who emphasise raw destruction through the summoning of beasts and the Sylvans who specialise in agility and control. 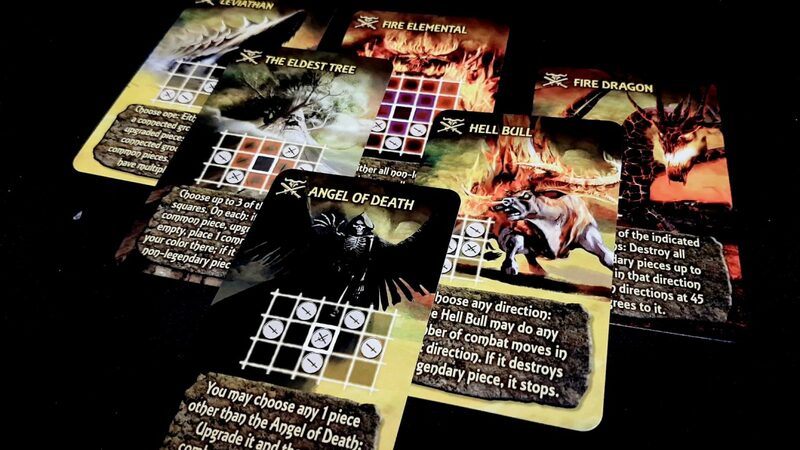 Regardless of which deck you adopt the game works in the same way – try to create the patterns on the board that will yield you the control needed to claim scoring cards. 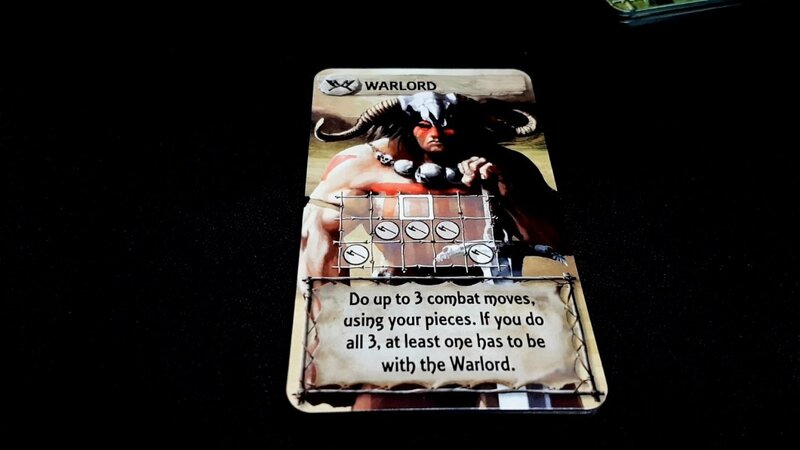 We’re only going to be talking about the ‘high form’ of Tash-Kalar in this review but there’s are also provided rules for deathmatches and team games. The ‘high form’ is basically the standard model of goal-driven player versus player competition you would expect. 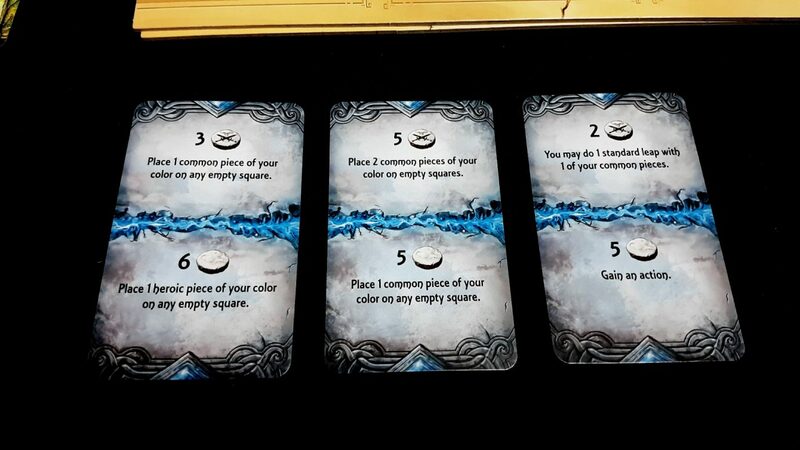 Pieces once placed remain placed until a summoned creature permits them to move or they are destroyed. The higher level a piece is, the easier it can defeat others if allowed to move. 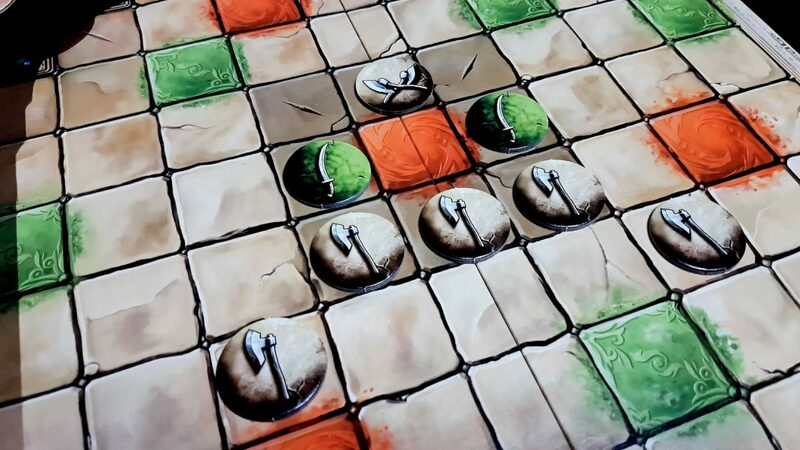 Pieces can ‘standard move’ onto pieces of a lower level and destroy them and can ‘combat move’ onto a piece of their level or lower. 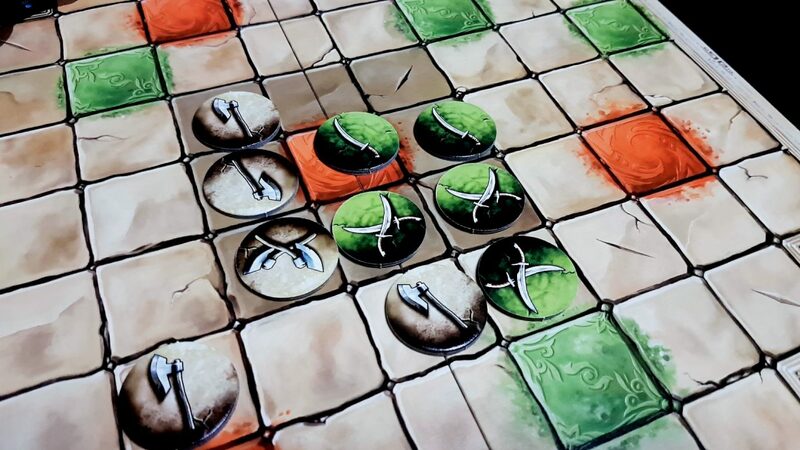 Pieces have three levels – common, elite and legendary. Legendary pieces are terrifyingly difficult to get off the board but equally hard to summon. 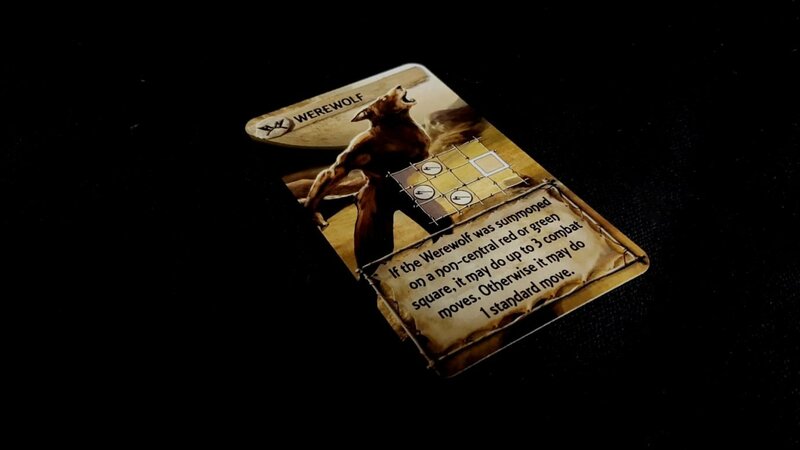 You can place a standard unit as one of your two actions during your turn but mostly they come into being by matching a pattern to a card in your hand. 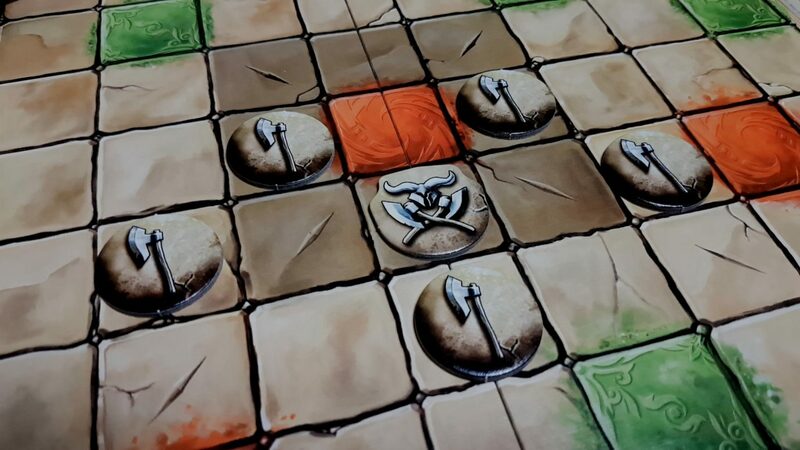 If you have three pieces of standard level or higher in a row, you’ll summon an elite summoner (indicated by the icon in the top left) on to the marked square in a pattern. 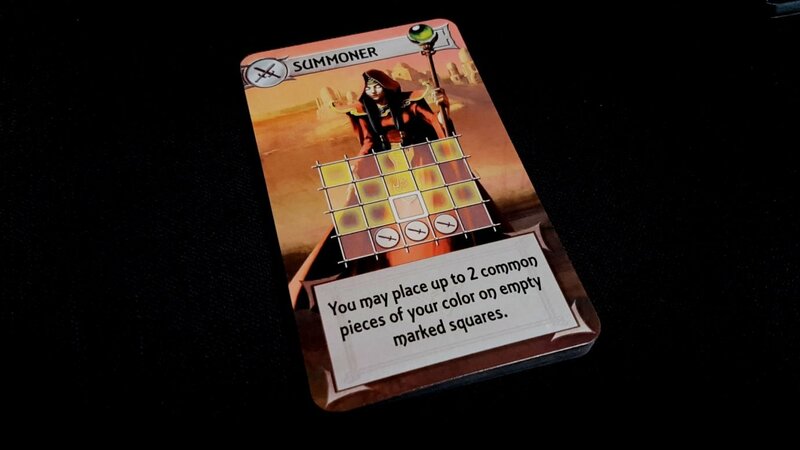 If you can do that, you’ll get to place two common units in any of the indicated squares as that summoner’s special ability. Once that’s done, your new summoner is just a piece – it has no special summoner properties that persist beyond the playing of the card. It becomes just another symbol in the pattern of the board until killed or empowered by later plays. 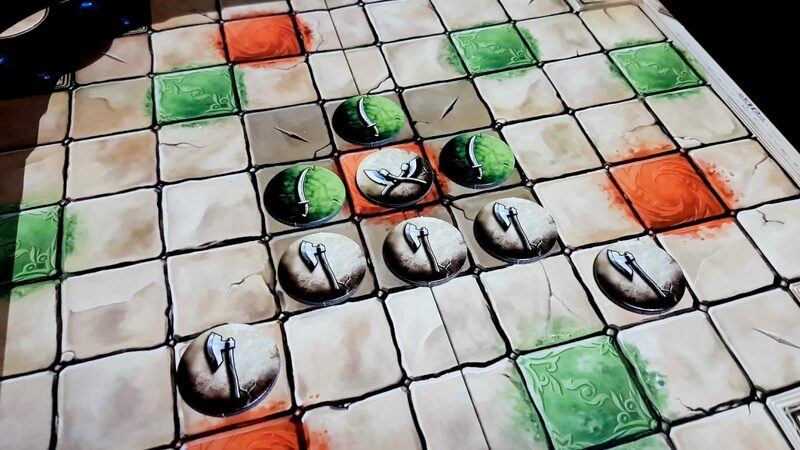 When you bring forth your units into battle they are robbed of their vibrancy and uniqueness and turn into mere tick marks in a great puzzle of tic-tac-toe. That’s the literal opposite of what I claimed above – that this is a game with a powerfully evocative theme. We’ll get to that. You fit the pattern so you summon your warlord. And then two of your standard pieces to destroy the ones in front of them. And in the process you just set yourself up to summon a werewolf in any of a number of directions. When you have this kind of cluttered melee you’ll need to work out how much you will risk through conservation of opportunity. Pieces can be wiped off the board in moments, and the legendary beast you can summon next turn might be too fragile a proposition for you to sacrifice the elite you can summon now. 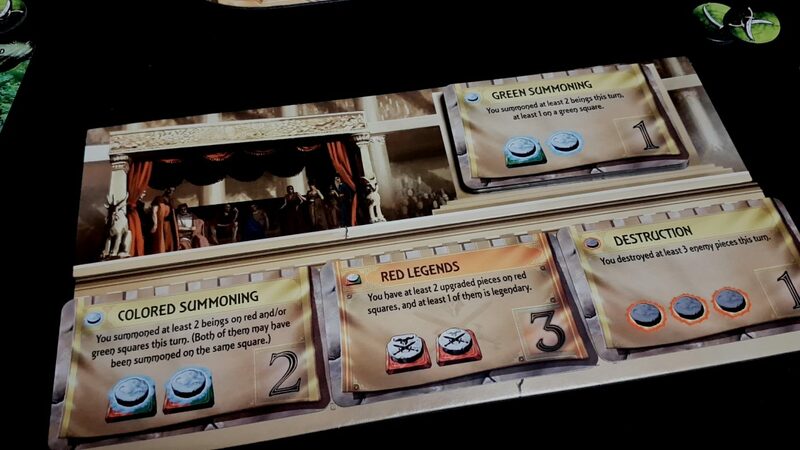 Those legendaries though – so powerful, so difficult to summon, so undeniably reliable in the economy of your board. Legendaries can rarely be shifted by anything other than another legendary, and so what they give you is sustainable command in an environment that is otherwise incredibly febrile. They are the rocks around which the waves crash. Like waves when they get riled up they can wash away practically anything in their path. Legendaries give you more than control of the battle – they basically give you control of the terrain. It’s over Anakin, my legendary is the high ground. Yeah, you can see why you might lose yourself in the puzzles at the heart of Tash-Kalar. This is a game that demands your mastery and amply rewards you for developing it. There are whirls and eddies and patterns in the strategic landscape of Tash-Kalar that will entwine you and drag you into their secret mysteries. There are no arguments surely that this is a rich game – certainly none that I will be making. But a thematic game? Everything about it seems like it’s about as evocative as your average tax return. What gives? It’s true that a game of Tash-Kalar, on the surface, has about all the narrative set-dressing of an unusually confrontational game of Connect-4. You do things that change pieces of one symbol into another, and then they sit there on the board with all the vibrant life-force of a sack of concrete. Occasionally these sacks of concrete are arranged in a way that gives you some points. Look a bit closer though. No, not there. No, not there either. No. Look at the cards. This is where you find all the theme, and it’s executed perfectly. You summon a Kiskin Boughrunner, a name which sounds like a lithe but powerful predator, and it strikes down a portion of your opponent’s armies with all the collaborative agility of a pack of hunting wolves. The Centaur chieftain encapsulates a kind of terrifying momentum, leading a charge of troops in a wave of synchronized slaughter. The charging buck leaps and strikes, leaps and strikes, exactly like the kind of bounding force of nature it is. The Kiskin Leafsplitter appears from the depths of its allies and then expertly buries two arrows into its foes in quick succession. When you summon the Highland war-drummer he permits two other pieces to make combat moves, each accompanied by the blood-freezing sound of battle percussion. 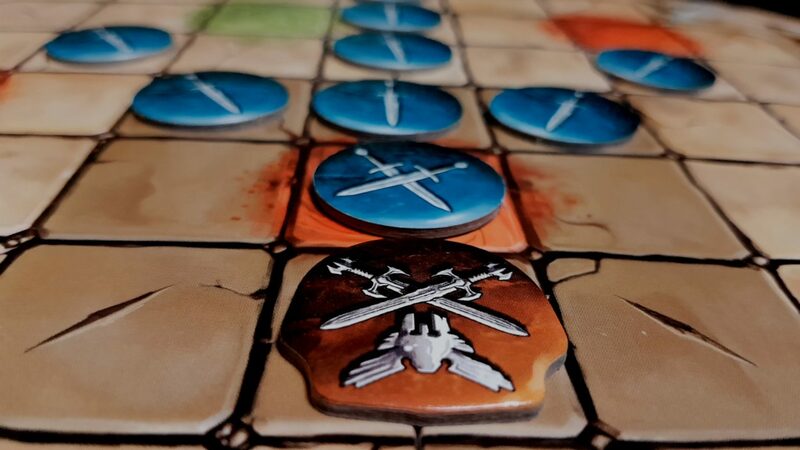 Every time I play I can vividly imagine the ebb and flow of the battle that results in these warriors entering combat, having their briefly cinematic moment of camera focus, and then retreating into the background of the scrum. Every battle in Tash-Kalar is made up of a series of awesome moments that bubble out of the otherwise abstracted melee. It’s as if the only thing you ever get to see, in your mind’s eye, is the highlight reel of the world’s bloodiest battle. There is a beautiful symmetry here between form (the warrior names) and their function. They cohere in a way that lets you tell stories, and that’s rare in a game of this nature. A game of Tash-Kalar between two well matched opponents is like watching a ballet where every pirouette is accompanied by an ostentatious mic drop. You can explain a battle in Tash-Kalar without reference to a diagram. The biggest strength of Tash-Kalar though is also its fundamental weakness. I said it above – between two well-matched opponents. That’s not just in terms of skill. It’s in terms of options within a turn. Tash-Kalar has a catch-up mechanic built into it, and it’s not just ‘In this unusual circumstance player X gets Y as a bonus’. You get a catch-up card in your hand at all times. It’s to be played when the tide of the battle goes so aggressively against you that you’ve realistically got no hope of getting back into the fight through conventional means. They’re called flares, and each card gives you two options for when you are outmatched by your opponent. The fact this exists is a warning. 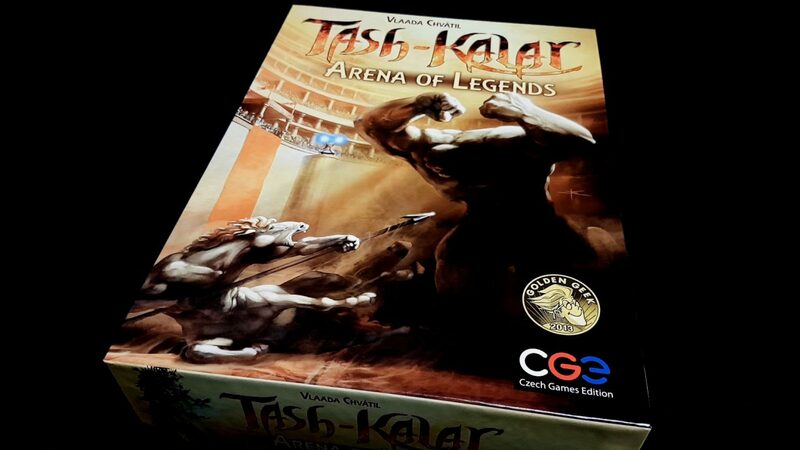 Tash-Kalar is a game that pivots, and that pivot is often violent enough to cause whiplash. It’s also a game that tends not to pivot back and that creates circumstances of intensely compounding advantage. The first two games we played of Tash-Kalar were great because neither of us really knew what we were doing and as such we were both equally matched. Equally inept, but equal. The third game we played of Tash-Kalar was zero fun for me because Mrs Meeple locked me out of any chance of accomplishing anything. It was like a cat toying with a mouse – she had so many units (including a legendary) that any time I tried to manoeuvre myself into position to summon something of value she’d just grind my them into the dust as just reward for my arrogance. It’s not even that this was frustrating. If it engendered anything it was a sense of hopelessness. Even with the flare cards I was playing every turn I just couldn’t dig myself out of the hole into which I’d permitted myself to stumble. It’s important here to emphasise that – it was a hole I walked into, not one that opened underneath me. It was avoidable, with skill and experience. I had neither. The next two games we played of Tash-Kalar it was different. This time Mrs Meeple was the one walking into holes. I was the one gleefully taking advantage of the opportunity gulf that was just getting larger with each round. That was so much more fun… for perhaps two turns. And then it just became a bit embarrassing. I offered a face-saving defeat and she accepted. Then we played again and got into exactly the same situation. Tash-Kalar is not fun when you’re losing badly and have no chance to recover, and it’s not fun when you’re winning comfortably and your opponent has no chance to recover. In this it shares a feature I discussed in relation to Iquazu – the amount of fun you have is directly linked to the amount of challenge in each round, and advantage will keep on accruing compound interest. Once you have a couple of legendaries on the board it becomes trivial to sweep aside any competition and then you’re just shoving pieces around trying to meet the byzantine scoring conditions. However, if you are well-matched you encounter another problem – the various spatial calculations you need to do tend to lead to a lot of down-time. It’s not even down-time where you can plot and plan. Your patterns are so fragile that while you can hope to accomplish something when you get to play you can’t at all count on it. The careful consideration of your options is often going to play second fiddle to your ability to react to surprises. That means that for all the thinking you do it’s only ever going to be aspirational. The best strategy is to build for flexibility because the game-state becomes very chaotic, and managing that chaos is what will determine your ability to profit from it. It means you can’t ever be complacent, but it also means that you need to learn how to ride the currents of (mis)fortune. To do that well also needs you to understand not just your deck, but the deck an opponent might be running. To play this game well requires you to become a scholar of its intricacies. That’s not unique to this game – Chess, Scrabble and other timeless classics all require a degree of homework in order for you to excel. While it’s not something I’m prepared to do I’m not going to begrudge a game for being deep enough to require contemplative study. In the end, Tash-Kalar is maybe the best game that I don’t really want to play. It asks more from me than I’m willing to give, and considerably more than I can ask of anyone else. It genuinely rewards skilful play but so brutally punishes mistakes that it takes a lot out of the fun of building mastery. It achieves exactly what I suspect it set out to do. I can admire its design and its accomplishments, but I’ve got too much else to do in my life to give it what it needs to shine. My life circumstances though are mine, and if you do have the time to turn a game into a lifestyle Tash-Kalar would be a great candidate for your consideration.